Come play with the Wildcat players and learn from the Wildcat coaches. This camp will be filled with fun drills, contests and scrimmages. Each player will receive a unique individualized evaluation and a complete summer practice program. In addition, each camper will get a Wildcat T-Shirt. The camp starts at 9am sharp (earliest drop off is 8:50) and ends at 3pm (lastest pick up is 3:10). Each camp will need to bring their own lunch but drinks and snacks can be purchased at the gym. Summer is the best time to improve your game and there is no better way than going to camp! 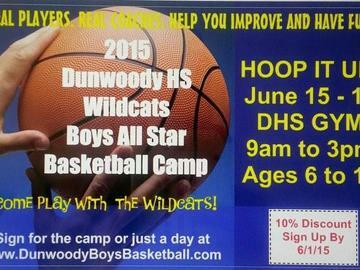 Come show us who the future stars of Dunwoody Wildcats Basketball will be!